Ancient Landscape Is Found Under 2 Miles Of Ice In Greenland : The Two-Way A revelation goes against widely held ideas about how some glaciers work, and it suggests that at least parts of Greenland's ice sheet survived periods of global warming intact. 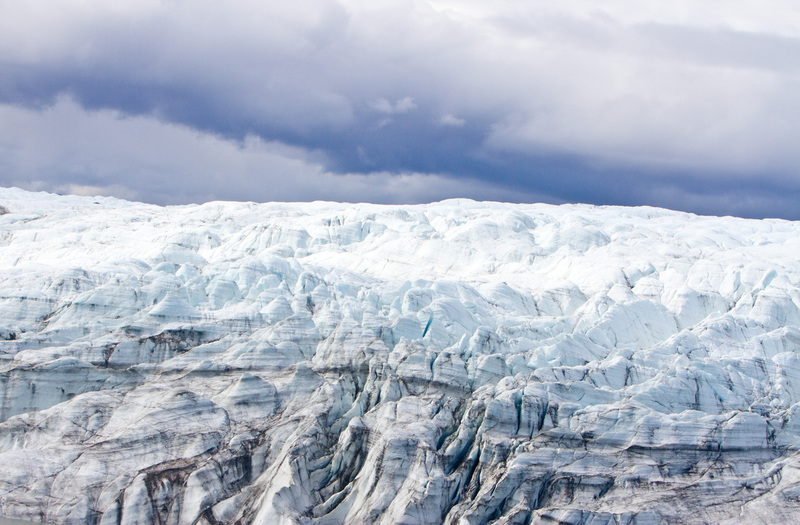 A new study suggests the Greenland Ice Sheet did not fully melt during previous periods of global warming — and that it preserved a tundra beneath it. In a surprising discovery, scientists have found evidence of a tundra landscape in Greenland that's millions of years old. The revelation goes against widely held ideas about how some glaciers work, and it suggests that at least parts of Greenland's ice sheet had survived periods of global warming intact. "Glaciers are commonly thought to work like a belt sander," a news release from the University of Vermont says. "As they move over the land they scrape off everything — vegetation, soil and even the top layer of bedrock." That's why researchers from several universities and NASA say they were "greatly surprised" to find signs that an ancient tundra had been preserved beneath 2 miles of ice in Greenland, in a study that was published this week in the journal Science. "We found organic soil that has been frozen to the bottom of the ice sheet for 2.7 million years," says University of Vermont geologist and lead author Paul Bierman. The researchers studied 17 "dirty ice" samples from the bottom of an ice core taken in the area of Summit, Greenland, looking for the presence of the isotope beryllium-10, which would signal an exposure to the atmosphere in the 10,019-foot "GISP2" sample that was taken in 1993. The ice core has been involved in many other studies — but few of those were focused on its very bottom. "I was asking a really different question than people who look at ice cores," Bierman tells the site LiveScience. "I was looking for a history of landscapes in ancient Greenland, and that mindset wasn't there 20 years ago. It's the evolution of science — you're always coming up with new hypotheses to test," he said. The scientists believed they would find only trace amounts of beryllium-10. Instead, they found millions of the atoms, LiveScience says. Bierman says that "we thought we were going looking for a needle in haystack." But, "It turned out that we found an elephant in a haystack." To put their findings in context, the researchers compared their results with data from a sample they took in the tundra that exists today, in Alaska's Brooks Range. The results were similar to those from the ice core, leading at least one scientist to say they'd found a new rationale for Greenland's name. "Greenland really was green! However, it was millions of years ago," says co-author Dylan Rood of the Scottish Universities Environmental Research Center and the University of California, Santa Barbara. "Greenland looked like the green Alaskan tundra before it was covered by the second largest body of ice on Earth." "The preservation of this soil implies that the ice has been non-erosive and frozen to the bed for much of that time, that there was no substantial exposure of central Greenland once the ice sheet became fully established, and that preglacial landscapes can remain preserved for long periods under continental ice sheets." In the University of Vermont release, Bierman warns that the ice sheet's survival of earlier periods of global warming doesn't necessarily mean it can survive the current warming trend in global temperatures. Of Greenland's ice that predates the human species, he said, "If we keep on our current trajectory, the ice sheet will not survive. And once you clear it off, it's really hard to put it back on."